In most areas that we are working in, we have been experiencing a dryer than average year and increased needs for irrigation. Whether your course is getting natural occurring irrigation (rain water) or having to supplement the rainfall with irrigation, applying the correct amount of irrigation is one of the toughest jobs that a superintendent has to face. Overwatering occurs for many reasons but one of the biggest is the fear of getting too dry and the tendency is to keep it wet. A great water source and well-drained soils can usually tolerate this a lot more than a course with poor water quality such as a secondary treatment facility or well water that is high in salt. The down side is that nothing good comes out of overwatering golf courses, especially the putting surfaces. Not all courses have a state of the art irrigation system with a built in weather station to work off of ET (evapotranspiration), but with moisture meters and some common sense, having a proper water management plan it is not as difficult as it sounds. Why is this so important? The main reason is turfgrass health is affected by overwatering. Saturated soils are lower in oxygen, which is detrimental to the development of healthy turfgrass roots and turf grass vigor. Additionally, saturated soils have a greater temperature increase under high air temperatures than properly irrigated soils under the same temperatures. From a turf health and management perspective, there really is no advantage to having soil moisture levels higher than necessary at any time, and in some instances, it is absolutely detrimental to the health of the turf. Overwatering also may necessitate increased mowing frequency to keep up with increased clipping yield compared to maintaining dryer conditions. As this occurs, you are also flushing out necessary nutrients because they have been leached thru the soil profile causing an increase in fertility costs. Some of the biggest hidden impacts of overwatering are its effects on playability. Overwatering creates soft playing conditions that most golfers hate. It is frustrating to hit a drive down the middle of the fairway, only to have the ball hit the wet fairway and lose its ball roll. It is often the case that drivers of golf carts find wet spots during their travels, creating further damage that must be dealt with. Unfortunately, many golfers do not appreciate a golf course with isolated areas of brown, dormant grass, even when it does not impact playability. This perception by golfers dictates that superintendents often err on the side of overwatering rather than under watering. • Use some type of moisture meter and soil probe to determine if the turf needs water and only water to the depth of the root zone and to the areas that need it. • Check the irrigation system for correct inputs and if possible, change out nozzles when an area may be getting saturated. 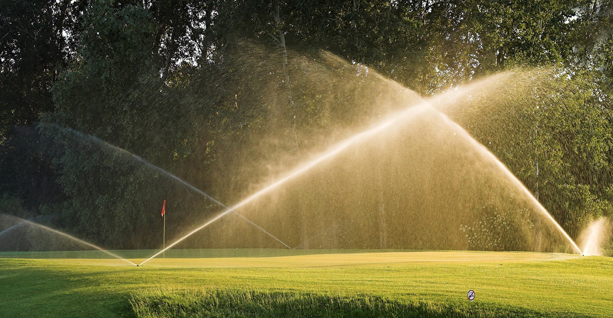 Using water resources as efficiently as possible will save money, provide you with better turfgrass health and resistance to disease and better playability resulting in better golfer satisfaction.